We Are Kenya's Leading Destination to Get Surrogacy Services, We Have exceptional team at Surrogate Mother Kenya is fully committed to providing intended parents, surrogate mothers and egg donors with the highest level of personalized service, care, and respect. You can feel safe and secure in knowing that we have decades of experience successfully managing the surrogacy process in Kenya. A woman who carries a baby on behalf of another woman, either by using her own eggs which are fertilized with the intended father or the eggs of the intended mother is used and the embryo implanted in her womb. Traditional surrogates are the Surrogate who is biologically related to newborn as her eggs are being artificially inseminated by the sperm of the intended father or donor sperm and then she carries a baby in her womb for 9 months until birth of a baby. Gestational surrogates are the Surrogate in Kenya who is not biologically related to a newborn as their eggs are not used for the IVF cycle. In this procedure, the egg of the intended mother or egg donor and the sperm of the intended father or the sperm donor are used in and the fertilized embryo then implanted in the womb of the gestational surrogate to carry the pregnancy. While we hire the Surrogate Mother Kenya we keep various factors in mind such as: • Surrogates should be fit and healthy • She should have pleasing and happy personality • Preferred married surrogates with kids • Thickness of endometrial should be > 9mm on day 15-18 • All blood tests investigation should be normal • The family of the surrogate mother and she herself understand the procedure properly and happily willing to carry the pregnancy for the intended parents. • Generally, we prefer that surrogates live in their own home so that they should be happy during the entire procedure which is very important and we observed that the changes of miscarriages are less when they stay at their own home. If they do not want to stay there then we have surrogate homes as well where they can stay. • We have surrogate agents who take their proper medical and personal care and also check if they required any assistance regarding the procedure. • Clinic coordinators also visit frequently to the homes of surrogates to ensure that they required any assistance and they are taking proper diet and medicines on time which are recommended to them for the procedure. • Pre-birth visits and ultrasounds are more frequent in surrogacy procedure than the normal pregnancy to ensure the healthy, safe and smooth pregnancy. • We have the best fertility experts who choose the best Surrogate Mother Kenya for the surrogacy process to ensure the intended parents for the best possible outcome and they follow the surrogates throughout the pregnancy. The Cost of medical expenses for Surrogate Mother Kenya includes the following: • Cost of the IVF cycle • Medical check-ups • Legal fees • Fertility doctor fees • Meal, accommodation, travel, clothing, medicines etc. The overall cost of the surrogacy is around USD 45,000 and the success rate of the surrogacy is around 70 to 80% in Kenya, which is quite high as compared with the other developed countries like the UK and the US. 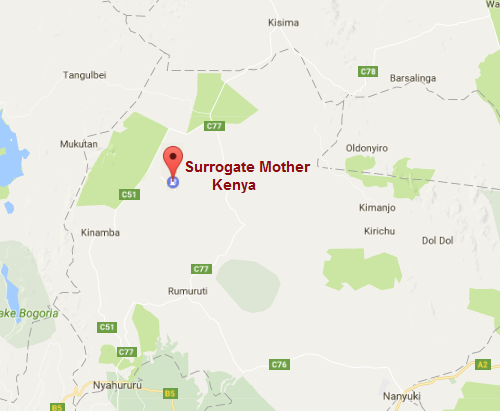 Address: Surrogate Mother Kenya, Nairobi – 80100 (Kenya).